Individuals do not always perform to their full capability on cognitive tasks. When this occurs, the usual explanation is that the individual was not properly motivated. But this begs the important question: How and why does motivation interact with and influence cognitive processing and the control processes that regulate it? What are the underlying mechanisms that govern such interactions? Motivation has been an important component of psychology and neuroscience throughout the history of the field, but has recently been rejuvenated by rapidly accelerating research interest in the nature of motivation-cognition interactions, particularly as they impact control processes and goal-directed behavior. This volume provides an up-to-date snapshot of the state of research in this exciting, expanding area. The contributors to the volume are internationally-renowned researchers that lead the field in conducting groundbreaking studies. Moreover, they represent a variety of research perspectives and traditions: cognitive psychology and neuroscience, animal learning, social, affective, and personality psychology, and development, lifespan, and aging studies. This book summarizes our current state of understanding of the relationship between motivation and cognitive control, and serves as an essential reference for both students and researchers. 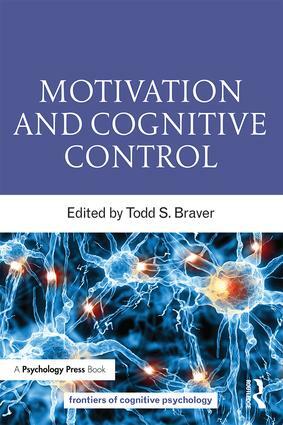 In Motivation and Cognitive Control edited by Todd Braver, excellent psychologists tackle the diverse ways in which motivation influences cognition, while in turn cognition regulates motivation. Altogether, this is a comprehensive handbook for anyone interested in motivation-cognition interactions. While usually studied separately, motivation and cognition are often inextricably intertwined. This book showcases evidence for these interactions across an array of psychological phenomena, constructs, and neural mechanisms from first-rate contributors to this expanding field. The issue of motivation has recently come to center stage in research on cognitive control. Braver, a leading researcher at the intersection of these two topics, brings together an interdisciplinary set of experts who view the control-motivation interface from diverse but complementary perspectives. Together, their contributions provide both a snapshot of current research and a roadmap for further investigation. This is a fantastic compilation of research on motivation and cognitive control. It spans a wide spectrum of topics, from the role of motivation on vision and attention to broader conceptualizations of the importance of motivation to cognition and self-regulation. There was a time when researchers of cognition could ignore motivation, and vice versa. That is definitely no longer the case, and this volume of contributed chapters provides an excellent compendium for investigators aiming at understanding their interdependency. Braver has brought together a very dense body of literature via highly sophisticated researchers… Academic practitioners of cognitive neuroscience will find the novel insights here as state of the art and fascinating… A wonderful but dense look into a subject that will fascinate many." Age-related changes in motivation: Do they influence emotional experience across adulthood and old age? Todd S. Braver, PhD, is a professor of psychology, neuroscience, and radiology at Washington University, St. Louis, where he has been since 1998. His educational training includes a BS in cognitive science from the University of California, San Diego, in 1992, and a PhD in cognitive neuroscience from Carnegie Mellon University in 1997. Dr. Braver codirects (with colleague Dr. Deanna Barch) the Cognitive Control and Psychopathology Laboratory at Washington University. His research uses convergent cognitive neuroscience methods to investigate the neural mechanisms of cognitive control processes. A particular focus is the function of the prefrontal cortex and its interaction with related brain systems in higher cognition, emotion, motivation, personality, and aging. Dr. Braver has authored over 100 peer-reviewed articles in some of the premier outlets of his field, including Science, Nature, PNAS, Neuron, and Nature Neuroscience. His research has been continuously funded by the NIH (NIMH, NIA, NIDA), NSF, ONR and private foundations through current and prior grants totaling over $12 million. Dr. Braver has received honors and awards for his research, including being named a McGuigan Young Investigator, an APS Fellow, and NIMH MERIT awardee. Frontiers of Cognitive Psychology is a new series of cognitive psychology books, which brings together the very latest research in core and emerging topics in the field, providing a comprehensive and up-to-date review of the current empirical, theoretical, and practical issues. Each volume provides handbook-like coverage a particular sub-area of cognitive psychology, yet is more focused and detailed than is possible in handbooks that attempt to cover the whole discipline. The series is an essential resource for senior undergraduates, postgraduates, researchers and practitioners, and will be suitable as core textbooks in advanced courses dealing with specific sub-areas of cognitive psychology.